What to get the kitchen geek who has every gadget and unusual condiment under the sun? Always a tough question this time of year. A subscription to What's She Eating Now? is a real bargain at the price of $0, but if you're feeling a little more flush and want to give something in addition, here are three stocking stuffers that may make your food lover forget all about that amazing Wusthof knife someone showed you up with last year. Damn you singing bass. 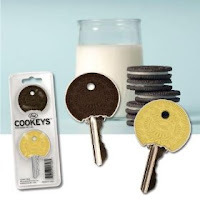 Cookeys: For the person who truly has everything food, except perhaps cute covers for their keys, this gift is thoughtful and inexpensive. Milk sold separately. Foodie Fight: Is your sweetie a competitive gourmand? Then perhaps this food trivia board game will fit the bill. 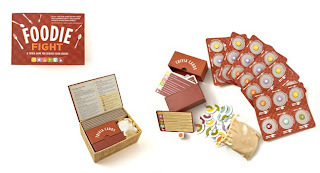 Endorsed by Jacques Pepin, Mario Batali and Lidia Bastianich, this game is sure to provide some spirited fun and perhaps provoke a little food trash talking. "Your answer is really sous vide? Remind me to never let you near my immersion circulator." Salt & Pepper 'Bots: Watch the video. These little guys practically sell themselves. A perfect gift for the couple who likes to sit on opposite ends of a really long dining table.